Prince George's County, Maryland, circa 1921. 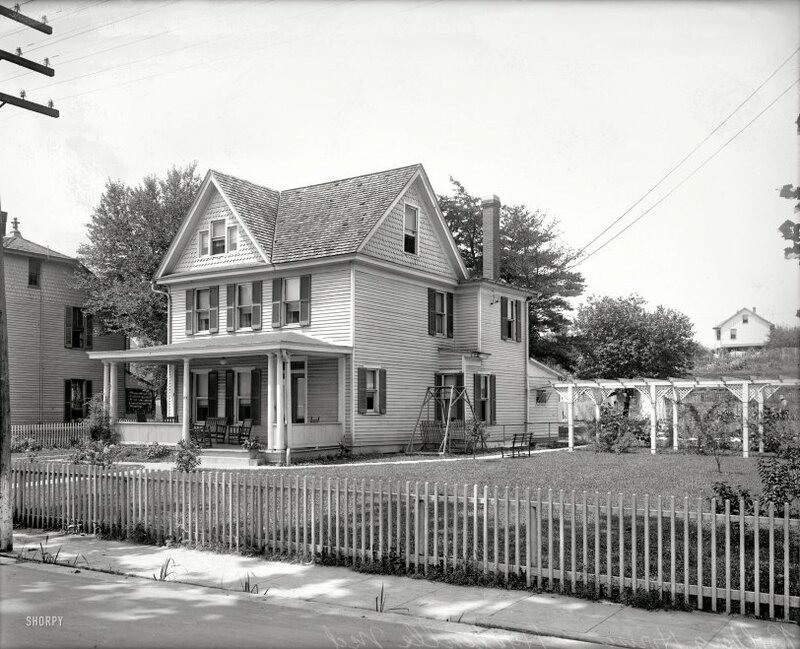 "Balberg house, Hyattsville." The address looks to be 137. Bonus points if you can find the street. View full size. Submitted by jumbo501 on Wed, 08/01/2012 - 7:43pm. Thanks Groucho! The key was provided by Splunge when he noted that way back in 1921, Maryland Avenue was the only street with lot numbers as high as 137. 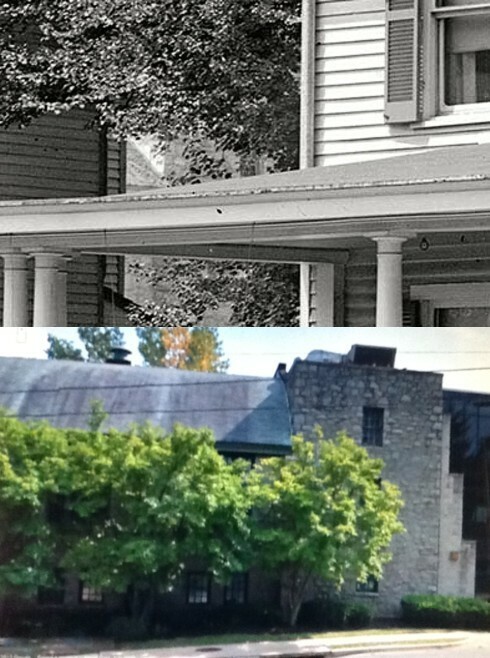 A quick check of the 1922 Sanborn map showed houses on Lots 135 and 137 that resembled those in the photo. Drawing a line on the map along the photographer's line of sight passing between the two houses, it intersected the north wall of a large building across the street (Maryland National Guard Armory). The building is still there, although it's now owned by a church. A trip around the block on Google Street yielded the photo clearly showing the sloping roof, stone wall, and window! Submitted by Groucho on Mon, 07/30/2012 - 9:54am. Jumbo, I think you're right but how in the world did you find it? I had to study your posted photos twice to see the similarities. Submitted by jumbo501 on Sun, 07/29/2012 - 8:28am. The building visible between the two houses is the north wall of the Maryland National Guard Armory. That means the two houses occupied Lots 135 and 137 on Maryland Avenue (now Baltimore Avenue), and both were demolished in 1929 to make way for the new 'C & P Telephone Co.' building, which was built in 1930. It's now the Verizon building. Submitted by stanton_square on Sat, 07/21/2012 - 5:18pm. Excellent sleuthing by E Helliwell and jumbo501. Max Vollberg was councilman (ca 1925-30) and mayor (1930-32) of Riverdale, Md. - now Riverdale Park. Submitted by jumbo501 on Sat, 07/21/2012 - 5:17am. 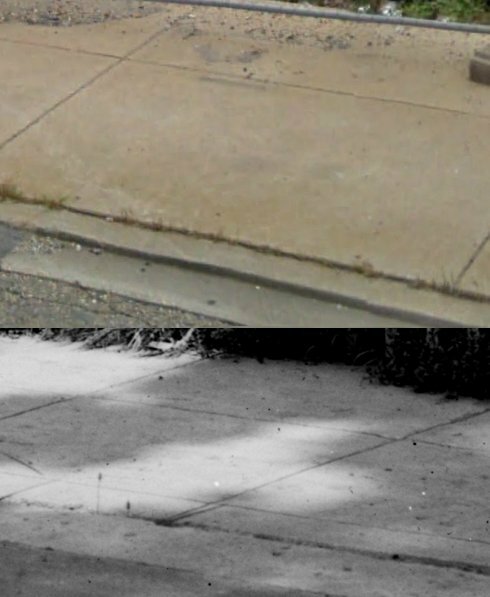 According to official Hyattsville records, in 1941 'Wingrest Avenue' was changed to the 4100 block of Decatur Street. Submitted by E Helliwell on Sat, 07/21/2012 - 12:46am. This is the house of Max Vollberg, not Balberg. It is at 137 Wing Rest Avenue. The family is in the 1920 census of Hyattsville. Mr. Vollberg's 1922 US Passport application has pictures on the second page showing members of his family and one picture showing a part of the front porch beams of this house. All of this information can be found at ancestry.com. Submitted by pattyanne on Fri, 07/20/2012 - 10:51pm. Oh, I can remember those old double swings. My grandmother had one of those!!!! Submitted by Phaedrus on Sat, 07/21/2012 - 8:37am. I figured the easy path to locating this house would be the 1920 US Census. Appears there isn't even a Balberg living in Maryland (not the first time I've been wrong). Also, having lived in the area I know that Hyattsville blends into adjacent communities, so the house could be as far north as College Park or south towards Bladensburg. Submitted by Splunge on Fri, 07/20/2012 - 10:04pm. Submitted by PGCist on Fri, 07/20/2012 - 11:32am. Street view may tell us, but my guess is either Farragut, Gallatin, or 42nd. Submitted by Splunge on Fri, 07/20/2012 - 4:36pm. I'm not sure if Dave knew it when he posted, but giving the house number from 1921 and asking for the street is a trick question. On 11 August 1941, Prince George's County (including Hyattsville) renamed and renumbered their streets to better match the scheme from neighboring Washington DC. Thus, today's Ingraham Street was Oak Street in 1921, Oglethorpe Street was Arundel Avenue; Locust, Park, Avon, and Adalyn Avenues were combined with Grove Street to create the modern-day 42nd Place, etc. The house numbers changed as well, so looking for a modern-day "137" will prove fruitless. I am following a few leads to identify this house and its location (I need all the bonus points I can get). Question for Dave, in case my frustration level gets too high - do *you* know the street name and true location? Submitted by gregkoos on Fri, 07/20/2012 - 10:30am. This is seen nicely here. Laundry is hung in the back of the house and a very pretty pergola creates a formal decorative garden in the side yard, and it hides the vegetable garden which is located behind. Note the gardener wearing a straw hat. Submitted by OTY on Fri, 07/20/2012 - 9:22am. Please advise what a Shorpy addict can do with his or her "bonus points" which you occasionally offer, as in this photo? Submitted by steelwheels on Fri, 07/20/2012 - 6:22am. It apperas that they painted the name of the street right on the pavement in the lower left corner of the picture, Shorpy Street. Nice houses way before they all got plastered w/Vinyl. Submitted by Jimmy Longshanks on Fri, 07/20/2012 - 4:17am. It's just past the fence and beyond the sidewalk. Submitted by Dutch on Thu, 07/19/2012 - 8:56pm. Looks like Becky Thatcher's house and Tom Sawyer is about to come along with a stick to run along that wooden fence.